For quantitative determination of β-glucosidase activity and evaluation of drug effects on its metabolism. β-GLUCOSIDASE is a glucosidase enzyme which acts upon β1->4 bonds linking two glucose or glucose-substituted molecules (i.e., the disaccharide cellobiose). β-Glucosidases are required by organisms (some fungi, bacteria, termites) for consumption of cellulose. Lysozyme is also a β-glucosidase and is present in tears to prevent bacterial infection of the eye. 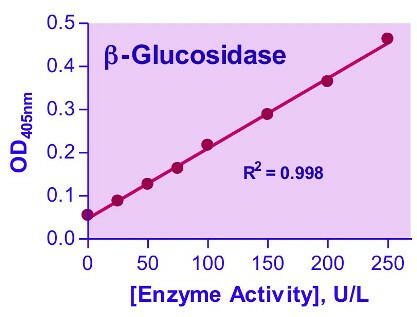 In humans, lower activity of a β-glucosidase isoform (lysosomal gluco-cerebrosidase) has been related to Gaucher’s disease and Parkinson’s disease. Simple, direct and automation-ready procedures for measuring β-glucosidase activity are becoming popular in Research and Drug Discovery. 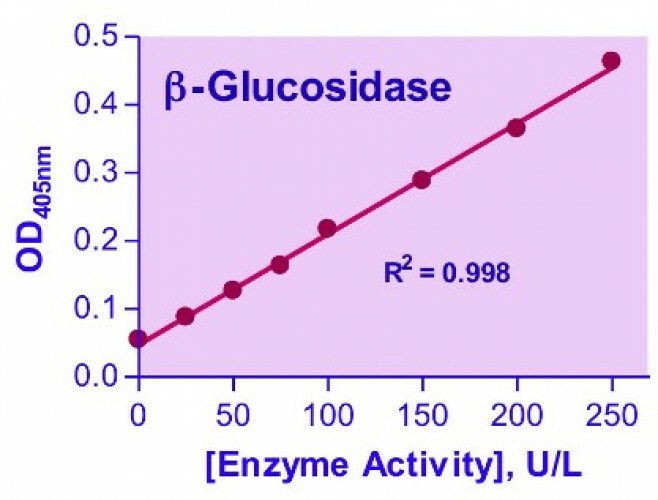 BioAssay Systems’ QuantiChrom™ β-Glucosidase Assay Kit is designed to measure β-glucosidase activity directly in biological samples without pretreatment. The improved method utilizes p-nitrophenyl-β-D-glucopyranoside that is hydrolyzed specifically by β-glucosidase into a yellow colored product (maximal absorbance at 405nm). The rate of the reaction is directly proportional to the enzyme activity. Applications For quantitative determination of β-glucosidase activity and evaluation of drug effects on its metabolism. References Assay: ?-Glucosidase in Human saliva (Pubmed). 2. Renchinkhand, G et al (2015). Identification of ?-Glucosidase Activity of Enterococcus Faecalis CRNB-A3 in Airag and Its Potential to Convert Ginsenoside Rb1 from Panax Ginseng. Journal of Food Biochemistry 40(1): 120-129. Bacteria in Enterococcus faecalis Assay. 3. Liu, Z et al (2014). Mammalian expression levels of cellulase and xylanase genes optimised by human codon usage are not necessarily higher than those optimised by the extremely biased approach. Biotechnology Letters 36(11): 2169-2176. Assay: ?-Glucosidase in Human saliva (Cells in Mammals) (Pubmed). 1. Mallery, SR et al (2011). Effects of human oral mucosal tissue, saliva, and oral microflora on intraoral metabolism and bioactivation of black raspberry anthocyanins. Cancer Prev Res (Phila). 4(8):1209-21. Assay: ?-Glucosidase in Human saliva (Pubmed).